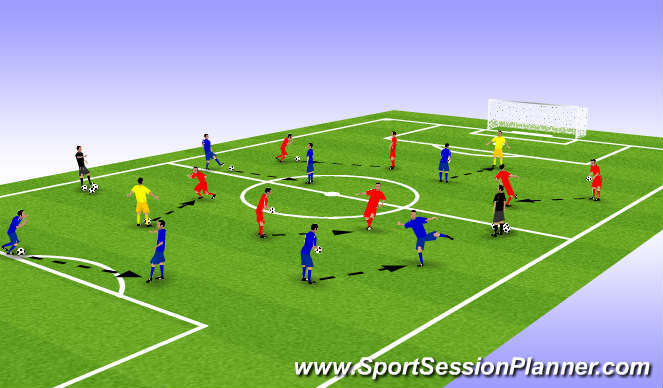 The Fitness for Soccer session will provide coaches a practical demonstration on how to incorporate 'fitness' into a training session utilizing the ball. The session will progress from individual, partner, small group, and team activities in a dynamic, challenging, and game-related environment. 1. 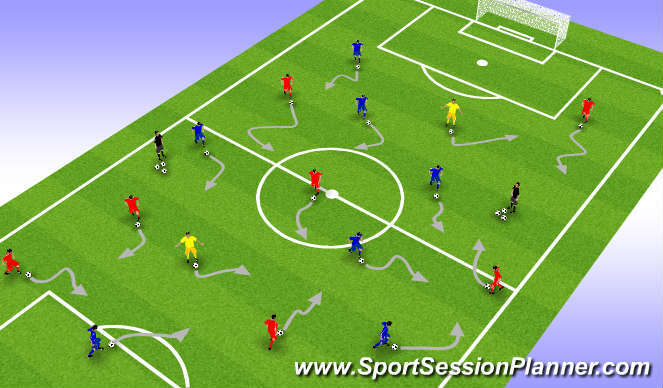 Dynamic movements without the ball. 2. Introduce the ball and increase the player&apos;s range of motion, change of direction, and speed. 3. Add disc cones as passive opposition and ball mastery objectives. Increase the temperature of the muscles. Increase the blood flow and oxygen to the muscles. 1. One and two touch variations. 2. Cone variations with sit-ups, push-ups, and tuck-jumps. 3. Nutmeg competition. 4. Plyometric competition. Increase the speed of nerve impulses - making you faster. Increase range of motion at joints reducing the risk of injury of muscles and ligaments. Three (3) variations: 1. 2 v 2 + 2 transitional handball exercise (on the ground) - progress to feet. 2. 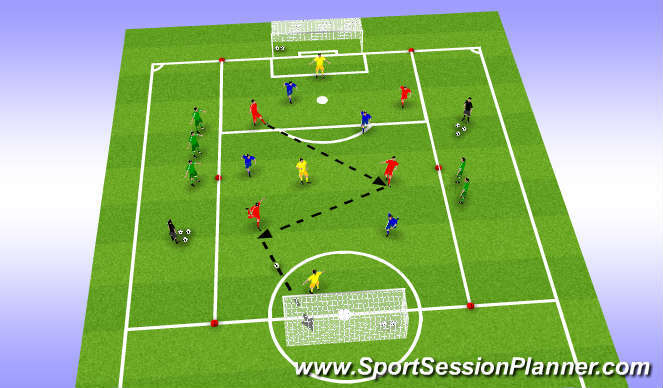 4 v 4 line soccer handball activity (as shown) - progress to feet. 3. Blackjack 21 head-catch possession game. Angles, distance, and timing of supporting players. Awareness of space and time. Speed of thought, play, and general decision making. Verbal and visual communication. Confident and aggressive attacking mentality. Transition game. 4 v 4 + 1 in the middle with goalkeepers to 2 large goals. The team on the outside actively watches. If a team finishes with a shot that is saved or missed, they immediately transition off of the field and they are replaced. If a team finishes with a shot and scores, they transition to the opposite side, and the team scored upon is replaced. 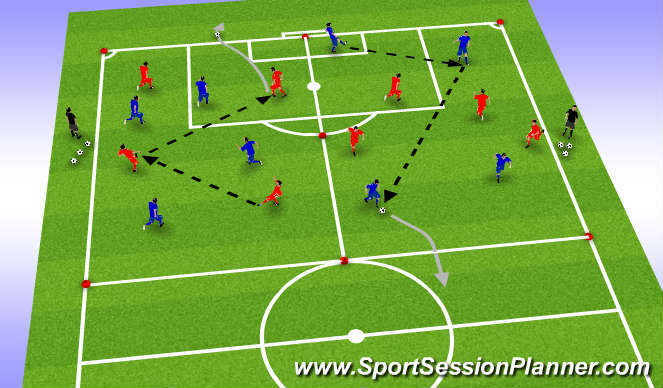 Attacking and defending transition. Correct shape and balance of the team. Tactical implications of technique. Creativity and instinctive play. Decision making. Fitness for Soccer.